TheFoodRoots.com: Let me help you out this Thanksgiving! Let me help you out this Thanksgiving! 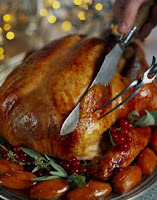 There's alot that goes into preparing a big meal like Thankgiving dinner, and I know most of us are busy people. If you don't have time to bake your own rolls this year and want a step up from the grocery store variety (in taste & nutrition) come & see me. I will be at the Belhaven Market selling frozen brown & serve Wheatberry rolls this weekend and next weekend. These rolls are based on my popular Wheatberry bread, with a few additions to make them tastier and more tender for a holiday occasion! Email me if you would like me to reserve a pan for you!